The iterator pattern provides a consistent way to sequentially access items in a collection that is independent of and separate from the underlying collection. The figure below represents the iterator pattern. Simplifies the interface of the collection. Access a collection object’s contents without exposing its internal representation. Support multiple traversals of objects in a collection. Provide a uniform interface for traversing different structures in a collection. 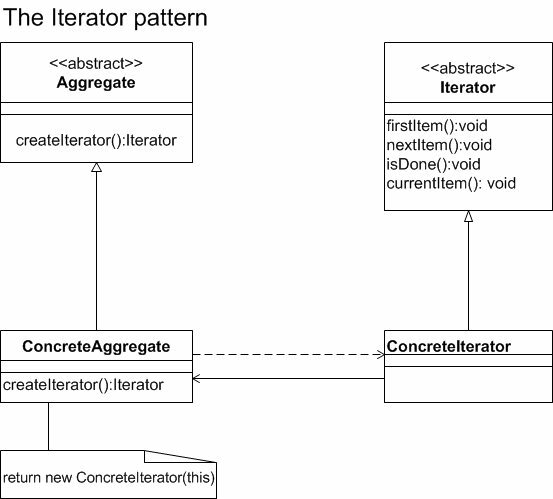 In object-oriented programming, the iterator pattern is a design pattern in which an iterator is used to traverse a container and access the container's elements. The iterator pattern decouples algorithms from containers; in some cases, algorithms are necessarily container-specific and cannot be decoupled. For example, the hypothetical algorithm SearchForElement can be implemented generally using a specified type of iterator rather than implementing it as a container-specific algorithm. This allows SearchForElement to be used on any container that supports the required type of iterator.